What is the Maturity RECEIVED Function? The RECEIVED function is categorized under Financial functionsFunctionsList of the most important Excel functions for financial analysts. This cheat sheet covers 100s of functions that are critical to know as an Excel analyst. It will calculate the amount received at maturity for a fully invested security. As a financial analystGuide to Becoming a Financial AnalystHow to become a financial analyst. Follow CFI's guide on becoming a financial analyst - networking, resume, interviews, financial modeling skills and more. We've seen thousands of people become financial analysts over the years and know precisely what it takes., the RECEIVED function helps calculate the amount that we will get from an investment if the duration of the investment and interest rate are given. Maturity (required argument) – It is the security’s maturity date or when it expires. Investment (required argument) – It is the amount invested in the security. Discount (required argument) – It is the security’s discount rate. Basis (optional argument) – It is the type of day count basis to be used. Excel stores data as sequential serial numbers so they can be used in calculations. By default, January 1, 1900 is serial number 1, and January 1, 2018 is serial number 43101 because it is 43,101 days after January 1, 1900. 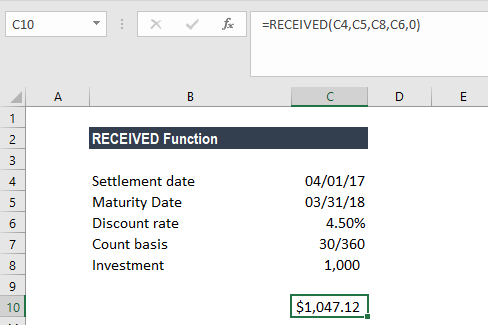 How to use the maturity RECEIVED Function in Excel? 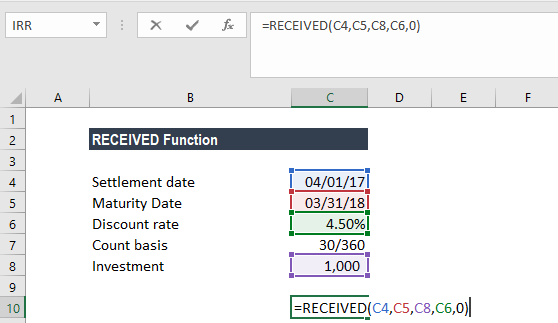 As recommended by Excel, the settlement and maturity dates are provided to the function as references to dates stored in cells B2 and B3. The discount argument is supplied to the function as a percentage value, 4.5%. It is also possible to provide the argument as the decimal value 0.045. The [basis] argument is omitted and so takes on the default value of 0 and, therefore, uses the US(NASD) 30/360 basis. The settlement or maturity arguments provided are not valid Excel dates. The investment or discount argument provided is less than or equal to zero. The basis argument given is not equal to 0,1,2,3 or 4. The given maturity date is less than or equal to the settlement date.